When Marion Welchman met the Committee of the London Word Blind Centre in the 1960s, offering to assist the fledgling organisation, she was given an inauspicious introduction. As Committee member Tim Miles recalls, Welchman was announced, ‘in a rather disdainful voice, as “a mother from Bath, who thinks she may be able to do something”. At the time, of course, none of us knew how much this mother from Bath would be able to contribute to the understanding of dyslexia not only in Britain but on a worldwide scale.’ Welchman went on to found the British Dyslexia Association in 1972, which remains the leading advocacy group for people with dyslexia in the UK. It’s the gendered experiences of women like Welchman that provide the premise for Montgomery’s engaging short book. 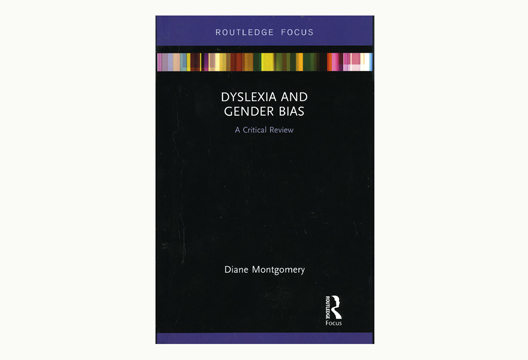 Specifically, Montgomery suggests that since the early 20th century, women in dyslexia research and education, despite being talented and many, have frequently had their work overlooked. After an impassioned introduction, Montgomery takes us through an underexplored history of women in the dyslexia world, highlighting the early remedial work of Americans Anna Gillingham and Bessie Stillman, as well as other notable figures like Edith Norrie, Sandhya Naidoo, Kathleen Hickey, Bevé Hornsby, Jean Augur, and Welchman herself. Montgomery’s thesis is that current provision is not where it should be, and that this is principally because of a ‘misogynist patriarchy’ that has historically hindered the efforts of these women, and others. As part of a research team compiling the UK’s first dyslexia archive, including a collection of oral histories with key names in dyslexia’s story (mostly women, but not only), I welcome Montgomery’s contribution. As I’ve written previously, the story of how dyslexia came to be recognised in the UK is a story in which women were at the forefront – as advocates, teachers and researchers. And it’s also one that’s largely yet to be told. Montgomery’s book adds significantly to this telling, and argues that these women’s insights can form the basis for future remedial strategies. As my quote above implies, though, I’m perhaps more optimistic about what these women have already accomplished. Often, they were required to graft their labour onto formal (usually masculine) channels of power; their work was not always given the respect it deserved; they were often dismissed as ‘worried mothers’. But their commitment has also taken dyslexia from a little-known and niche concept, to widespread recognition by political authorities and (at least some) state support. There’s certainly been gender bias in dyslexia’s history, but these women managed to make substantial progress for dyslexic people despite it. The challenge now, as Montgomery says, is to build on their legacy.